(CNN) -- Dustin Johnson has been handed the AT&T Pebble Beach National Pro-Am title after the delayed final round was scrapped because of flooding at the California venue. 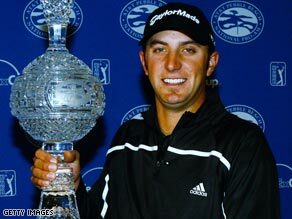 Dustin Johnson is one of only two players under-25 on the U.S. Tour with two titles to their name. Sunday's play had been put back 24 hours after wind and rain lashed the course, but organisers quickly recognised on Monday that it would be impossible to complete the schedule. The decision meant that 24-year-old third round leader Johnson claimed his second career PGA Tour title with an overall score of 15-under-par 201. Currently in his second full year on the Tour, Johnson joined Anthony Kim as the only players currently under-25 with two titles. Johnson held a four-shot advantage over runner-up Mike Weir after a five-under-par 67 at Poppy Hills fired him to the front after three rounds. Johnson was two strokes off the pace at the start of Saturday's play, but overhauled Retief Goosen, who shot a 74 at Spyglass Hill to relinquish the lead. Birdies on four of his last nine holes moved Johnson to 15-under, while Canadian Weir returned a 69 at Spyglass Hill to go second ahead of former U.S. Open champion Goosen. South African Goosen was chasing his first PGA Tour title in more than three years. Johnson's success promoted him to 45th in the world rankings and means the left-hander is first reserve for next week's Accenture World Match Play in Arizona. World number one Tiger Woods still has to announce whether or not he will be making his comeback at the event after knee surgery.